Ceramic artist Paul Barchilon creates intricate designs that take us on a voyage of discovery within the circle, delineating patterns that repeat through different symmetries. Mr. Barchilon has traveled the world, researching pattern and line designs in India, Turkey, Spain, Peru, and China. His father was born in Morocco and Barchilon lived both there and in France as a child. From the beginning, he was fascinated by the complex patterns and the magnificent architecture of the Moorish era. 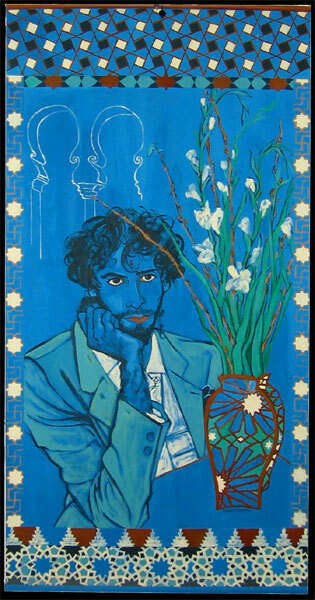 In his twenties, the artist began an in-depth exploration of Islamic pattern. He toured artisans' studios in Morocco visiting Safi, Fez, and Marrakech. He studied traditional ceramics, tiles and brass etchings. The florid brass platters of Morocco, with their intricate detail and complicated interlacings, were a direct influence on Barchilon's own platters. Further north, in Spain, he visited the Alcazar in Sevilla and the Alhambra in Granada. He took extensive rubbings of both classical tile patterns and Zalij, the traditional art of geometric mosaics. Returning to Boulder, Barchilon analyzed the patterns he had catalogued. Working only with a compass and a straight edge, he learned the foundations of designing in arabesque. He began by painting his patterns in Gouache and then moved to projecting them on platters as well as carving them on slab built vases. In 1995, Barchilon went to India to study the designs of the Mughal masters. He spent five weeks traveling throughout the country and took over a thousand photographs detailing carvings, metalwork, tiles and inlays in precious stone. Barchilon was born and lives in Boulder, Colorado. He studied ceramics at the University of Colorado but it was not until he began to explore Moroccan art that he found his niche. He originally learned traditional methods and worked on paper in pencil and ink, dividing circles and bisecting angles with techniques that have remained unchanged for millennia. Recently, Barchilon has begun to use the computer as a tool for making his designs, integrating his skills in geometric patterning with the modern capacities of the digital age. The computer provides a powerful new way of seeing lines and their possibilities, but in the end it is the eye of the artist that must be the final arbiter. Working from within a 1300 year old tradition of geometric design, Barchilon's original patterns pay homage to their sources but imbue them with a modern sensibility. For a great interview with Paul, check out Connie Norman's blog. To arrange a studio visit, email Paul. If you are interested in Mandala patterns, you should check out Clare Goodwin's website. The resources link will take you to a comprehensive listing of mandala artists and topics on the web.